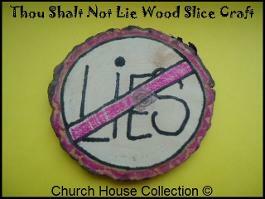 This is one of our wood slices that we sell through our store at "Church House Woodworks Etsy Store". I broke all of the ten commandments down for the kids each week and this is just a craft idea for the kids to have fun with. Let them draw on a wood slice to make this. This particular craft goes along with our lesson that we offer, "Thou Shalt Not Lie Sunday School Lesson". Have the kids color the wood slice red all around the very edge then have them use a black marker to draw a circle on the wood slice . Just follow the grain of the wood and it will make a perfect circle. Have them draw a line through the middle going sideways and write the words LIES in the middle. You might need to help the kids do this or just let them have fun with it and if they mess up, then no big deal... This wood slice will fit in the palm of my hand. You could buy the bigger wood slices we offer and let them turn this into a drink coaster for home. We offer the wood slices in different sizes. I posted a picture above so you could see how large the wood slice was. 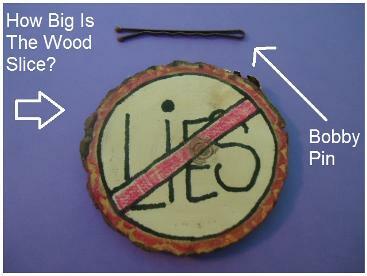 I laid a bobby pin that goes in your hair above it so you could get a good idea. If you are interested in buying some of these little wood slices for your children's church class or Sunday school class to make these then go to our Church House Woodworks Etsy Store. Keep in mind that you might want to message us through our store and let us know that you are wanting this specific wood slice for this craft so we can make sure you get the correct wood slices. We sell all kinds wood slices that vary in sizes and shapes. To message us just go to our store and on the left hand side under our picture it will say, "CONTACT". Hit that button. Sign up by registering your name, email, and a password. Pretty simple. 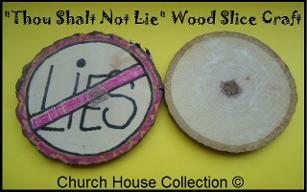 Then just message us and let us know that you need the wood slices for this craft, "Thou Shalt Not Lie" Wood Slice Craft. Check out all our lesson plans for the Ten Commandments. We also have a Ten Commandments Bible Matching Game.